Disclosure: I received free copy of Camperstop Europe 2017 for this review. Links marked with (eBay⇒) or (Amazon⇒) are affiliate links. This means I get paid a small commission if you buy something after clicking on the links. This money helps to pay for the running of the website. 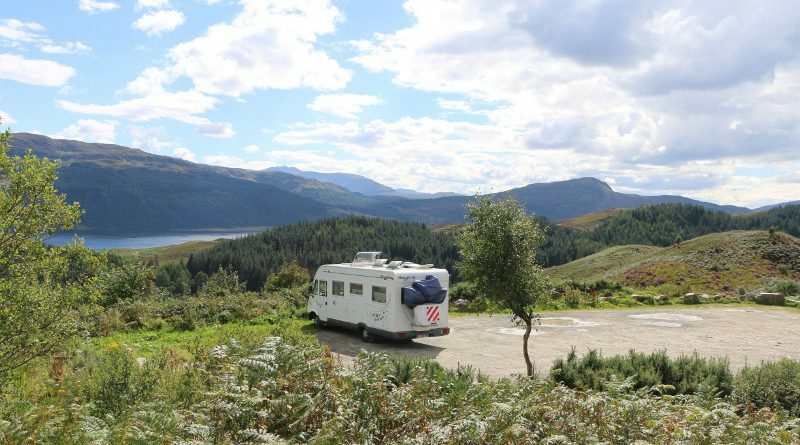 When we first reviewed the Camperstop European motorhome stopover guide in 2013, it listed 7,420 motorhome stopovers. In 2015, the figure was 8,033. In 2016, it was 8,910. This year’s guide, Camperstop Europe 2017, made a big thump when it came through the letterbox. And no wonder. The directory has expanded again and now contains 9,651 camperstops in 27 countries, 7,099 of which are listed with photos. It’s a hefty tome at 696 pages, but in my opinion having this information in a single printed format remains the best option for trip planning and when on the road. As in previous years, it’s also possible to purchase sat nav data sets to use with the guide — see camperstop.com for details. However, as an added bonus, publisher Facile Media now offers a free app which allows you access all of the information in the book, free of charge. What you can’t do is download any of this — so a mobile signal and data allowance will be required for access. If you’re on holiday already, that could prove costly. If you want to be able to download the Camperstop maps, then there’s a paid version of the app which currently costs €4.99/year. The app is available for iOS and Android – more info here. 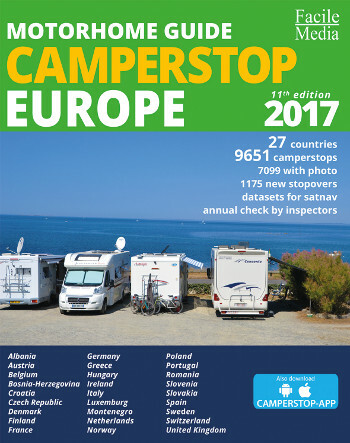 Camperstop Europe 2017 is easy to use. The guide is organised into two main sections, maps and camperstop listings. Each map is marked with camperstop locations. Below each map is an index, so you can look up the page for that stopover location. Each camperstop listing includes a graphical key to facilities, GPS co-ordinates, price details and a photo, where available. It’s all very simple to use. What type of stopover location is included? The stopovers in Camperstop 2017 are categorised into no fewer than twelve categories. These include official motorhome stopovers (aires), farms/vineyards, restaurants, parking areas directly outside campsites and campsites. If you want a full choice of stopover locations and don’t want to be tied to campsites, then Camperstop 2017 could be an ideal. In my opinion, Camperstop Europe 2017 is an ideal one-book companion to help you find safe, legal and affordable stopover locations all over Europe. In the UK, Camperstop 2017 is also available from Waterstones, Stanfords, Blackwell’s, Mapsworldwide.com, Outdoor Bits and Vicarious Books. ← Will Airglide paint protection help keep your motorhome clean? Great but in Nazare they are use as permanent stop for greedy people should be a limit to how long they can stay for free. NOT THE WHOLE BLOODY WINTER FOR FREE.